Sometimes when you get busy day to day you forget to look back. And then nearly three years pass. Well, the last two days I started the process of looking back on 96 episodes of The Crisis Show​ while “ripping” the audio files for an exciting library I am putting together that will be sold this Spring as The Crisis Show Library. That’s about 100 hours of crisis management education, save a few technical hiccups and my personal bloopers. Since June 2012, my fabulous guests have talked about workplace violence, natural/man-made disasters, major product recalls, negative media coverage and social media snafus that harm reputation. And we’ve analyzed major mistakes/misstatements/omissions by public figures that include CEOs, world leaders and celebrities. I’m humbled that I’ve attracted these many amazing guests almost every week to make the show such a great educational tool worldwide — as the show has been seen at least once in more than 100 countries. And now, I’m excited to create an effective training product that is one-of-a-kind for company and organization executives and their staffs anywhere in the world. I’ll be rolling out The Crisis Show Library in May or June to coincide with our third anniversary on air and after we pass our 100th episode. Updates on the availability of this library will be posted here as well as @RichKleinCrisis and @TheCrisisShow on Twitter and on Facebook. Please feel free to DM on either of those Twitter accounts if your organization is interested in receiving this unique archive. 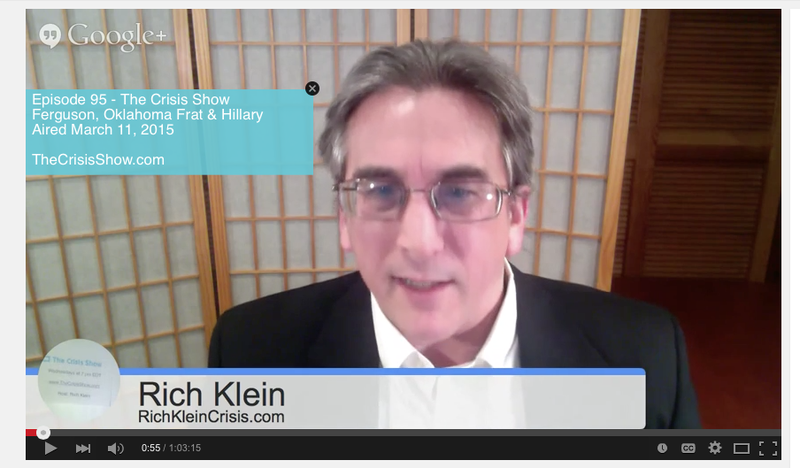 Or email: rich@richkleincrisis.com. And thanks to everyone out there who has supported the show and our mission to educate!